MOST people still see freelancing as a blip in one’s career. Yet an increasing number of people are looking at building a career with so-called short-term contracts, or gigs. Rather than full-time employment with a creative agency, a graphic artist, for instance, can choose to be his own boss by promoting his skills online to source for projects from anywhere in the world. Forward-looking businesses, too, are latching onto this trend. As firms may not need to employ as many full-time workers, office spaces could shrink in size and more people could work on specific projects rather than for one specific company. Japanese fintech group Finatext Ltd, an out-of-the-box data analytics company that set up shop in Malaysia early this year, for example, keeps an extremely lean workforce. The company — which chooses to forecast the economic growth of a country by analysing alternative indicators such as satellite images of night-time lights, and to predict stock price movements using data gathered from social media platforms such as Twitter — works with a lot of freelancers and only has three full-time staff. “Though we put emphasis on automation and efficient workflow, some regular tasks require the attention of a dedicated person. In this case, we may opt to hire a freelancer to focus on those tasks. We also seek help from freelancers for their niche expertise when such skill is not available in-house,” says Finatext Malaysia Sdn Bhd executive director Ruiz Asri. Finatext does not require a large office space as the firm is very flexible when it comes to working hours and is comfortable with remote work, he adds. As these independent workers will not have the support found in a traditional office, they are likely to conduct their work in co-working spaces. WORQ has created an entire ecosystem and a community to take care of workplace needs and facilitate deeper connections between the firms and freelancers that set up in their space, says co-founder and CEO Stephanie Ping. “I’ve seen rampant growth in this form of work and I expect it to continue heading in this direction in the future as more people come out to work independently with the help of technology,” she says. And more companies are likely to require less office space in the coming decade, not from employing freelancers, but because as much as 70% of jobs can potentially be displaced by advancements in artificial intelligence (AI). 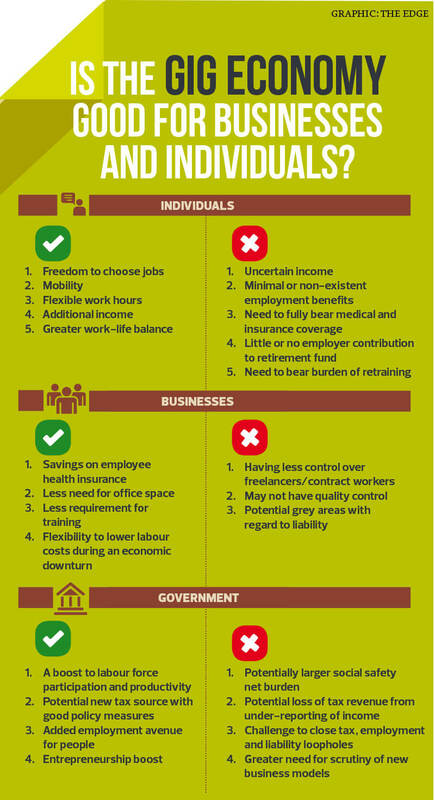 This is why the country needs to greatly improve and expand its social safety net to protect these independent workers, says Khazanah Research Institute director of research Allen Ng. “Different people could be good at specific areas, which means there will be greater flexibility of work and more choices for the people. The social safety net that we have in place was not built for such a level of flexibility,” Ng says. One of the best safety nets would be to inculcate lifelong learning for all amid the rapid cycle of obsolescence and renewal in the types of work available, driven by the accelerating developments in technology. That, he says, is the most important skill Malaysians need to prepare themselves for the future workforce. Equally important is the need for benefits — such as healthcare and retirement savings contribution that usually come with full-time employment — to be portable rather than being tied to a particular job or firm. “Having portable benefits is one way of moving away from the existing social security net,” Ng says. “For example, I could be working for Uber for three hours and then maybe shift to drive for Grab for the next few hours. Both employers can contribute to the benefits system based on the amount of work I have put in. “And the same goes for any other form of independent work. It can be moved from one employer to the next, providing the stability and security of more traditional safety nets in these alternative work arrangements,” he explains. 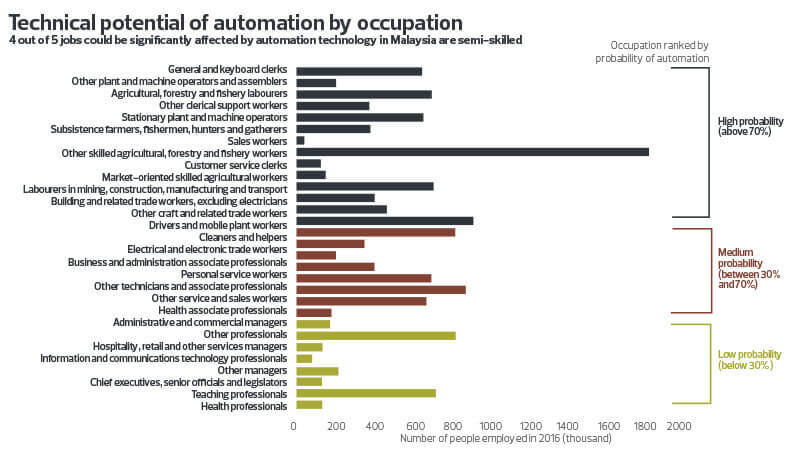 Is Malaysia prepared for the future of work? Employees Provident Fund deputy CEO (strategy) Tunku Alizakri Raja Muhammad Alias points out that Malaysia, as well as most governments around the world, are still trying to figure out how to handle this transformation in the employment landscape. “This is just another evolution of the economy that is seeing exponential growth and policymakers around the world are still figuring it out and most are playing catch-up,” he says. While Malaysia has started to put certain measures in place to prepare for the changing employment landscape, Alizakri says more needs to be done if the country plans to thrive in the new environment. One of the key changes that needs to be made would be the education system. Currently, Malaysia has a more compliance-based education system, while the future demands more of creativity and innovation, which Alizakri says has been lacking in the education system. Taking the US’ education model as an example, he says creativity is embedded in the education system, encouraging innovation in students from a young age. The US has also embraced innovation, building bridges between many innovators from around the world and Silicon Valley, he highlights. “We need to transform our education system. Malaysia has a more compliance-based education but we also need to spur creativity. We do have pockets of creativity here and there but we need to do more. After all, innovation is creativity implemented,” says Alizakri. He adds that transparency will be key in the future as the work history of these workers could be up for public viewing, especially with the developments in AI and big data. “The good workers will be picked up by algorithms and detected almost instantly for upcoming projects and thus we need to nurture global workers for the Malaysian workforce to stand a chance in the intensely competitive environment of the future,” he says.